HV FRIDAY & WEEKEND WEATHER UPDATE: Rain showers will affect the Hudson Valley during the morning hours on Friday. However, the rain should end around lunchtime, so Friday afternoon is looking mostly dry, with temperatures in the 60s. Saturday will be sunny and warm here in the Hudson Valley. High temperature will reach into the 70s in many of our communities. The only little issue for Saturday is that it will turn rather windy. Sunday will feature sun and clouds, with conditions remaining dry through Sunday evening. Temperatures will be a bit cooler on Sunday, with highs around 60F. So all-in-all it looks like a “worry-free weather weekend” once again here in the Hudson Valley! 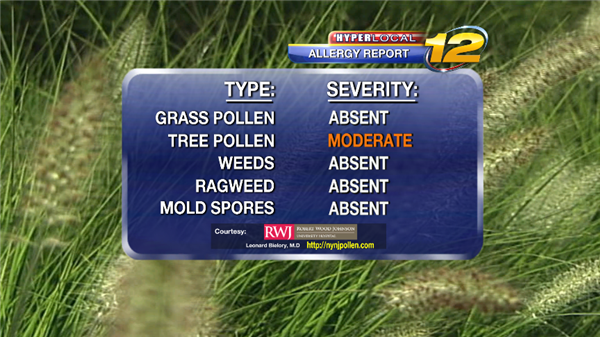 Updated pollen counts for the Hudson Valley. The rain today will help a bit, but sunny sky and warm temps this weekend will cause those counts to rise again! 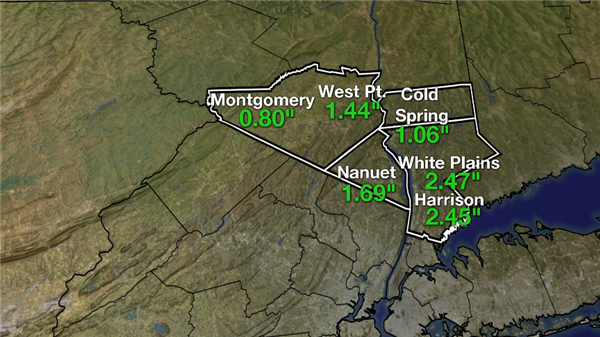 Here are some hyper-local rain totals from the storm that has been affecting us since Monday here in the Hudson Valley. 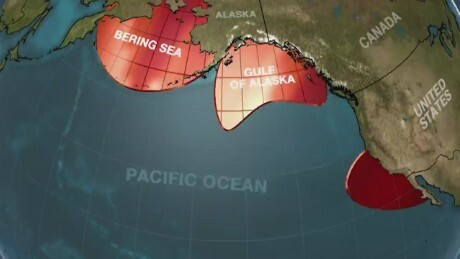 CNNTemperatures in some areas of Pacific are much higher than normal, affecting marine life and weather, studies from University of Washington appear to show. Thursday's morning allergy report for the HV...I do not see much rain through this weekend, so I expect pollen counts to increase again this weekend. Here is Wednesday morning's allergy report for the Hudson Valley. Pollen counts are on the rise! Your Wednesday morning allergy report for the HV. The lack of rain will continue to allow pollen counts to rise in the air! ELLENVILLE, N.Y. (AP) - Fire crews have almost completely contained that pesky forest fire in New York's lower Hudson Valley region. Damp weather conditions Tuesday night and early Wednesday allowed firefighters to improve containment of the fire along Shawangunk Ridge that has burned through four square miles of state forest land over four days. State officials say just over 100 firefighters are going back out Thursday to continue efforts to extinguish what remains of the blaze, which is 90 percent contained. Temperatures are expected to rise and dry, windy conditions are forecast for the next few days. 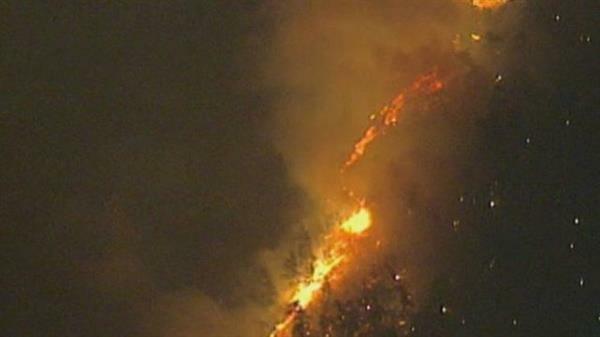 That's expected to create conditions similar to Monday and Tuesday, when the fire intensified. The blaze, about 100 miles north of New York City, is believed to have been started by a homeowner burning debris outdoors. Here is your Tuesday morning allergy report for the Hudson Valley. HV WEEKEND WEATHER UPDATE: Saturday will be partly sunny, warm and humid here in the Hudson Valley. While scattered showers and storms are possible, most of Saturday will be dry. I think the best chance to see showers will be early Saturday morning, and again later Saturday afternoon. 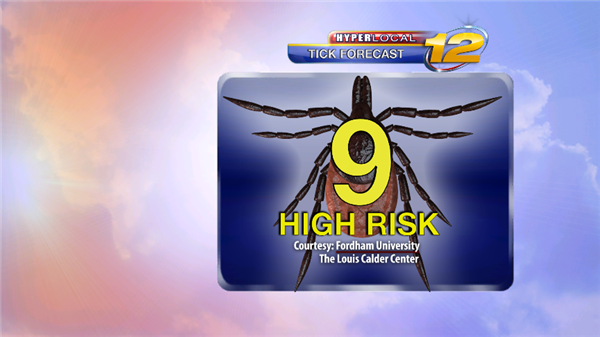 With that being said, prepare to dodge some drops if you are heading outdoors on Saturday. Sunday, at this time, looks dry. Under a mixture of sun and clouds, highs will warm into the lower 80s on Sunday here in the Hudson Valley. WEEKEND WEATHER UPDATE FOR THE HV: Rain showers this morning will taper off between 9am and 10am here in the Hudson Valley. From 10am to 5pm conditions will be mostly dry, so don't change or cancel outdoor plans during this time. Another round of showers and storms will affect us from 5pm until 9pm this evening. Sunday continues to look dry here in the Hudson Valley. Friday will feature sun and clouds here in the Hudson Valley. It will be breezy, but warmer than the past few days with highs on Friday returning to the lower 70s. Saturday will be mostly sunny, but breezy and cool, as afternoon highs return to the 60s here in the Hudson Valley. So maybe not great pool and beach weather, but pretty perfect weather for anything else you want to do outdoors. Sunday will stay dry and sunny, and temperatures will warm nicely back into the middle and upper 70s! In addition, it will turn a touch humid, which is actually good for pool and beach activities. Memorial Day itself, I am currently keeping dry, even though a shower or storm may be possible come Monday evening. There will be a lot of extra clouds around on Memorial Day, but it will be warm, with highs well up into the 70s. For those heading to the beach, water temperatures are only in the 50s, so be prepared for a chill there. In addition, the sunburn index will be HIGH or VERY HIGH all weekend long, so make sure to put on that sunscreen. Enjoy and be safe! I will send updates all weekend long as needed. Here is your Wednesday morning allergy reports for the Hudson Valley. Friday will be mostly sunny, dry and less humid here in the Hudson Valley. Afternoon highs will top out in the lower 80s. Saturday will start off sunny, but you will notice some extra clouds later in the day. However, I think any showers and storms will hold off until Saturday night. Highs on Saturday will be around 80 degrees. Sunday will be partly sunny with scattered showers and storms likely. While Sunday may not be a 100% washout, be prepared to dodge drops during most of the day, if you do have outdoor plans. With the clouds and showers it will be cooler on Sunday, with highs only in the 70s. Saturday will feature sun and clouds here in the Hudson Valley, with highs reaching into the lower 80s. There is the chance for an isolated late day thunderstorm on Saturday, but my advice would be to not cancel or change any outdoors plans for Saturday, as most of us will stay dry. Sunday will be a different story. Showers and storms appear likely throughout the day on Sunday. So if you still plan to head out on Sunday, be prepared to get wet. With the clouds and showers, highs on Sunday will only reach into the lower 70s. Stay close to News12.com over the weekend for LIVE weather updates. Here is your Thursday morning allergy report for the Hudson Valley. You knew absent pollen counts would not last long! Friday will be mostly cloudy here in the Hudson Valley. While a morning shower or some drizzle is possible, most of Friday will be dry. So my advice is to not cancel or change outdoor plans at this point. Highs will reach in to the upper 60s. Saturday and Sunday look GLORIOUS here in the Hudson Valley. It will be sunny, dry and warm both days, with highs this weekend in the 70s. The sunburn index will be VERY HIGH all weekend long, so grab the sunscreen, head out, and enjoy some pretty perfect June weather here in the Hudson Valley. HV WEEKEND WEATHER UPDATE: Conditions will feel rather summer-like as we head into the weekend here in the Hudson Valley. Friday will feature a mix of sun and clouds. It will be very warm and humid, with highs well up into the 80s. In addition, some late day t-storms are possible on Friday, with most of the activity arriving for Friday night. Saturday will be partly sunny, very warm and humid, with highs again well up into the 80s. On Saturday, widely scattered storms are possible, but most of Saturday will be dry here in the Hudson Valley. So if you are OK with a “rain delay”, I would not change or cancel outdoor plans for Saturday. Sunday will be sunny and totally dry here in the Hudson Valley. In addition, the humidity will decrease a bit, with highs dropping back into the lower 80s. HV WEEKEND WEATHER UPDATE: Saturday looks mostly cloudy here in the Hudson Valley, with some scattered showers now possible. I don't see a washout for Saturday, but there may be some drops to dodge. Temperatures will run a few degrees below normal, with highs in the middle 70s. Showers and storms are likely Saturday night. Sunday is Father’s Day, and the 1st Day of Summer; unfortunately, it continues to look a bit wet, as the remnants of Bill will roll through the Hudson Valley producing some heavy downpours. The rain may taper off for Sunday afternoon. Stay close to News12.com for LIVE weather updates this weekend. 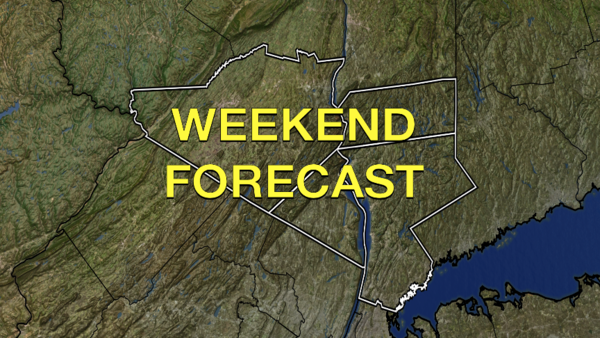 HV WEEKEND WEATHER UPDATE: Unsettled weather on-tap for us this weekend here in the Hudson Valley. Friday will feature leftover morning showers, but Friday afternoon should be dry, with highs in the 70s. Saturday will start of dry here in the Hudson Valley. As of now, I am not expecting any rain through 12pm. However, by 2pm or so, rain will arrive here in the Hudson Valley. Saturday evening and Saturday night look like washouts, with a steady rain expected. It will be cooler on Saturday, with highs only in the lower 70s. For Sunday, the steady rain will turn into scattered showers as we head through the day. In fact, Sunday afternoon look mainly dry, with only some widely scattered showers possible. Highs will remain in the 70s. Saturday morning will be mostly cloudy and dry here in the Hudson Valley. A steady rain will develop early to mid-afternoon on Saturday, and last into Saturday night. With that in mind, Saturday afternoon and Saturday night look to be complete washouts here in the Hudson Valley. It will be very cool on Saturday, with highs only in the lower to middle 60s. 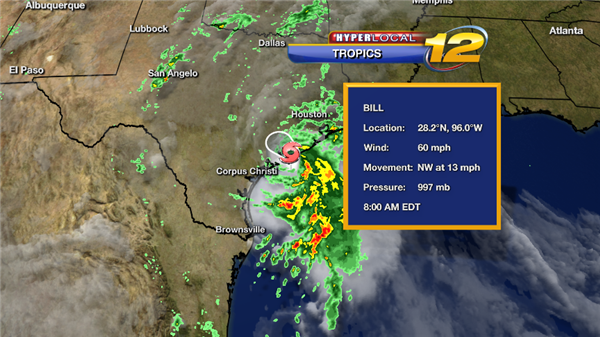 The steady rain will end early Sunday morning. Sunday will be mostly cloudy with scattered showers likely. However, Sunday will not be a total washout. 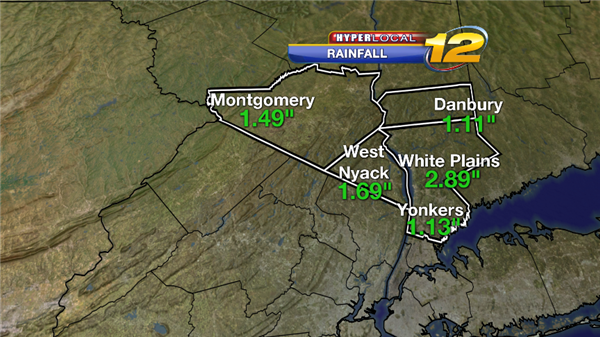 In fact, there will be a lot of dry periods during Sunday here in the Hudson Valley. With less rain, highs on Sunday will return to the 70s. Stay close to News12 and News12.com for LIVE weather updates through this weekend. HV WEEKEND WEATHER UPDATE: Conditions are looking good here in the Hudson Valley, as we head into the long Holiday Weekend. Friday will feature of mixture of sun and clouds here in the Hudson Valley. It will stay dry and be rather pleasant with afternoon highs in the upper 70s. The 4th of July on Saturday will feature a few extra clouds, especially in the morning; we will call it partly sunny for Saturday, with highs in the upper 70s. While a brief shower is possible early in the morning, I feel that most, if not all, of the 4th will be dry. So do not change or cancel any parade or bbq plans! Sunday continues to look sunny, dry and warm with afternoon highs returning to the 80s here in the Hudson Valley. The sunburn index will be VERY HIGH all weekend long here in the Hudson Valley. So head out and enjoy this Holiday Weekend! HV WEEKEND WEATHER UPDATE: The 4th of July forecast has taken a turn for the worse! We expected low pressure to track out to sea on Saturday, but now that low is going to take a track closer to the coast. This will introduce the chance for showers, starting later Saturday morning and lasting into the evening. In addition, it will be awfully cool, with highs struggling to reach 70 degrees! So for those afternoon BBQs on Saturday, please be prepared to dodge drops. The weather breaks Saturday night, with sunny, dry and warm weather returning for Sunday, with high temperatures back into the 80s. Here is your Thursday morning allergy report for the HV. Saturday will feature sun and clouds here in the Hudson Valley. Saturday will be totally dry and less humid, with high temperatures reaching into the lower and middle 80s. Sunday will be partly sunny and a bit more humid. I think most of Sunday will end up being dry here in the Hudson Valley, with only an isolated shower or thunderstorm to dodge. So I would not cancel outdoor plans! Highs on Sunday will be in the 80s once again.